XCMG XR460D -- China's Largest Hydraulic Retractable-Chassis Drilling Rig_Company News_News_JINNING UNITED CONSTRUCTION MACHINERY CO.,LTD. Before 2011, the spiral drilling rigs over 40 tons in China were monopolized by foreign manufacturers. Chinese makers, due to concerns on accessibility of key technologies and availability of the equivalent parts and accessories, especially the chassis of the rig, were anxious but unable to do anything. The pricing power was in hands of foreign companies. However, XCMG found a way and had its XR460D spiral-drilling rig came into being. To develop the chassis without a reference was a huge challenge, but XCMG knew it was the key leading to making such heavy rigs and started a special R&D program as a pioneer in China. In the design process, XCMG conquered difficulties in the chassis tensioning device, H-type frame’s structure, three-pump converging, and single-row rope winding. Meanwhile, other key technical difficulties were subjugated, such as single-roller-and-double-motorhigh-power winding, big-torque power head rock-drilling control, full electric-controlled smart operating system, big-triangle luffing. Thus, the heaviest spiral drilling rig in Asia came out in XCMG, which, having an XCMG-made chassis, as a condensation of XCMG’s technologies, filled multiple technical blanks in China and made XCMG the forerunner leading R & D of heavy machines. With the acceleration of domestic infrastructure and civil construction, the scale of piling foundation projects is getting larger. The requirements on depths and dimensions of hole boring, especially in projects of river and bay bridges, are higher. 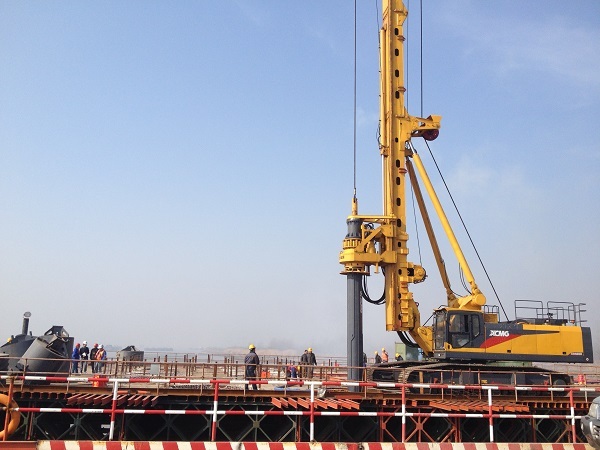 XCMG XR460D keeps making records in deep and ultra deep piles. Currently, XR460D is the only Chinese-made 40t/m spiral-drilling rig, which achieved bulk sales in the domestic market. It has a reasonable price, less than half of the imported equivalents. XR460D was chosen by some large-scale state key projects such as the East Loop-III Expressway at Xuzhou, Yangtze Bridge at Wuhu, and Zhuhai-Hongkong-Macao Bay Bridge, where it has done a great job and well accepted by its users.